The healing touchstone of millions, this modern classic by one of America's best-loved and most inspirational authors holds the key to understanding codependency and to unlocking its stultifying hold on your life. Is someone else's problem your problem? If, like so many others, you've lost sight of your own life in the drama of tending to someone else's, you may be codependent--and you may find yourself in this book--Codependent No More. The healing touchstone of millions, this modern classic by one of America's best-loved and most inspirational authors holds the key to understanding codependency and to unlocking its stultifying hold on your life. With instructive life stories, personal reflections, exercises, and self-tests, Codependent No More is a simple, straightforward, readable map of the perplexing world of codependency--charting the path to freedom and a lifetime of healing, hope, and happiness. 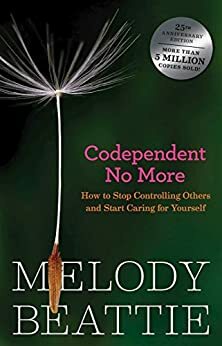 Melody Beattie is the author of Beyond Codependency, The Language of Letting Go, Stop Being Mean to Yourself, The Codependent No More Workbook and Playing It by Heart. I am not normally a fan of "self help" titles. I tend to cringe at the very thought, and to be honest I was doing just that when this was recommended to me. However, I like to keep an open mind so I dove in. Codependent No More did not feel like a guide book or advice being thrown around. It read with an eerie sense of familiarity. As I poured through the case studies, I found myself thinking "that is me!" or "I know this person!". It was soon very obvious that I did not understand what being codependent meant. I had always viewed this as a negative label stuck on those whose loved one where addicts. But it is so much more. In fact this is a problem that effects many. I cannot recommend this title enough. If you are struggling, read it. If you know someone who struggles, read it. If you do not understand codependency, read it. There is something to be taken from Codependent No More for everyone. It is a refreshing perspective and read. I enjoyed this book. It mainly focuses on the person living with an alcoholic or an addict, that person in this book is referred to as the codependent. A term not used by many in the field of psychology now, but it is a term most everyone can relate to after reading this book. I believe everyone to some extent has codependent characteristics. Some people may suffer because that is completely who they are, they live their life taking care of addicted people. Some people may not suffer severely because it is not their entirety, their life may involve living with an addict, but they can separate their 'self' from that person's problems. I suppose living with an addict brings out codependent characteristics in everyone, and in varying degrees. The bottom line is, in my opinion, let those addicts take care of themselves. Let them go and try to recover on their own, live YOUR life for you. I wanted desperately to help the man I loved with his lifelong addiction and tried for as long as I could. I found myself losing my 'self' by trying, that's when I knew I had to let go. 5.0 颗星，最多 5 颗星Helping me to change my life! Yes, this book is absolutely helping me change my life. All these years of pain, trying to fix everything for everyone, whether they asked for it or not, anxiety, depression, craziness and then ultimately losing who I was completely and ignoring desperately needed self care. I now understand why I did the things I did. I saw myself in every page and every paragraph. This book is a huge step forward in self care! I feel understood, supported and encouraged. I'm learning and changing. It feels amazing. I give this book and "The Language of Letting Go" as gifts to my fellow codependent friends. I hope when they are ready that they read this. Because I KNOW it will help anyone who is codependent. I promise you that if you're codependent and ready to live better that this book will help you!